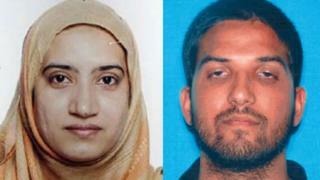 FBI Director James Comey said there were indications that the couple had been radicalised. Tashfeen Malik, 27, and her husband Syed Rizwan Farook, 28, died in a shootout with police after the killings at San Bernardino, east of Los Angeles. Mr Comey said they were "potentially inspired" by foreign terror groups. However, he said there was no evidence they were part of a network. Mr Comey said the investigation was in its early stages and that there was still "a lot of evidence that doesn't make sense". Earlier, an FBI spokesman said they were also investigating reports that Malik had pledged allegiance to Islamic State (IS). She is reported to have posted a message on Facebook in support of IS leader Abu Bakr al-Baghdadi under a different name. The post has since been removed. The Farook family's attorneys said on Friday that Farook was an isolated individual with few friends and Malik was a "caring, soft-spoken" housewife. They said there was no evidence that either suspect had extremist views. The family was aware that Farook owned two handguns and said co-workers had made fun of his beard, the attorneys said. In another development on Friday, the couple's landlord opened their apartment to the media, prompting journalists and camera crews to go inside and survey the scene. There has been strong criticism on social media for several outlets including the BBC, but the FBI had released the residence to the landlord before he let journalists in. After Wednesday's attack at the Inland Regional Center social services agency, bomb equipment, weapons and thousands of rounds of ammunition were found in the couple's home. FBI spokesman David Bowdich told a news conference that authorities were trying to recover data from two mobile phones found crushed in a waste bin near the shooting scene. He said "telephonic connections" had been established between the couple and other people of interest to the authorities. "We have uncovered evidence that has led us to learn of extensive planning," he said. Investigators are also said to be following up a report that Farook had argued with a colleague at work who denounced the "inherent dangers of Islam". Malik was born in Pakistan and had recently lived in Saudi Arabia. Intelligence officials in Pakistan have contacted relatives there, a family member quoted by Reuters said. Farook, who worked as an inspector for the city's environmental health department, was the son of Pakistani immigrants and born in the US state of Illinois. Police said between 75 and 80 people were attending a party at the centre when the shooting began. Media captionSaira Khan, shooting suspect's sister: "I can never imagine my brother or my sister-in-law doing something like this." The identities of the victims have since been released by San Bernardino's coroner. The youngest was 26 and the oldest was 60. Local police chief Jarrod Burguan said it appeared that the couple were prepared to carry out another attack. In the shootout with police hours after the attack, Farook and Malik fired 76 rounds of ammunition. Officers fired 380 rounds back. One of the first officers on the scene spoke of scenes of "unspeakable" carnage in the centre. Lt Mike Madden said he and officers saw dead bodies and had to pass injured people as they tried to "engage the shooters" on Wednesday.